We are always happy to help with color selection. We know from experience that our hard work and labor loose their value if you are not completely happy with the colors. We usually start by asking your favorite colors. Most home-owners already have aan idea as to what kind of colors they like to see on their home. Once we have an initial starting point, we come out with our collection of most popular Benjamin Moore color samples and apply them right one the surface. 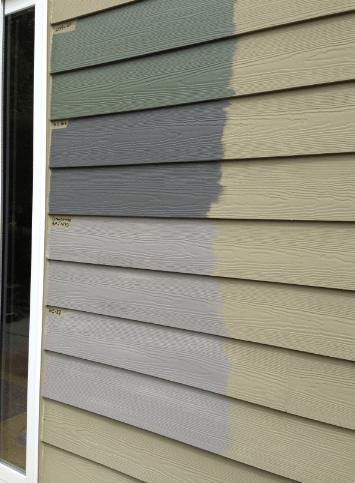 While color swatches might be helpful, we believe the actual paint, applied on the surface is the best way to get a feel for the finish product. Once the samples are applied, we encourage you to live with them for a few days, and view them in different lighting conditions. Whats the most popular color? Browns and Grays have been very popular in the last 5+ years. We have a large selection of samples – different browns and grays available from the Benjamin Moore paint company.